The world shattered for me three years ago in a hotel in China. Suffering had touched my life in a new way. The following day we traveled to our daughter’s orphanage. The world’s pain and heartache was wrapped around my heart in ways I could never explain. It changed me. Since then I realize the need to pray for my friends in new ways. Prayer was what got our family through some really rough months. When we arrived home three years ago, I had several friends going through their own storms. One friend had found her unborn baby held a heart condition. Another friend was spending days, weeks, and eventually months in hospitals trying to figure out what was making her little girl sick. More people I knew were suffering. Even though our family was suffering through a hard time, we lifted up our friends in prayer. The value of prayer is beginning to grow again and again in my heart. Those first few months home we had countless people praying for us. It was those prayers which held us up. The prayers to the Father for our family sustained us. I believe that with all my heart. 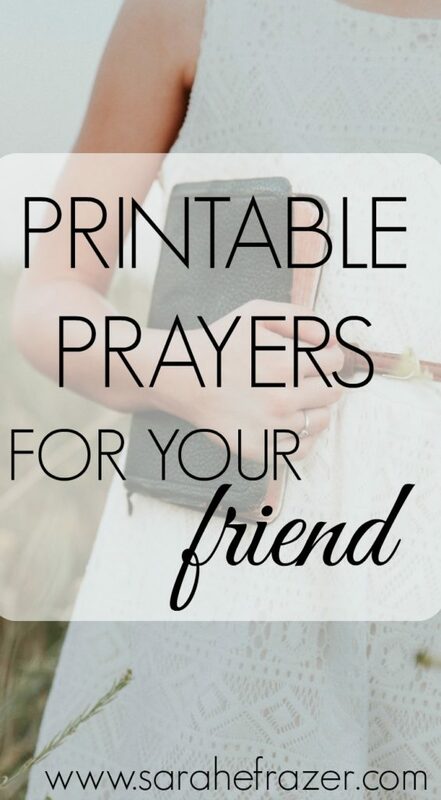 Do you pray for your friends? Let me encourage you to find the words to pray for them today. Most of the time I’m overwhelmed with the amount of need in the world. Orphans. Refugees. Immigration. Economy. Many times the social media will show me over and over again people who are suffering. What if we prayed for those right in front of us instead? Pray for those the Lord places on your heart today. Don’t worry about all of the people you could pray for, pray for the people right in front of you. The sister, brother, or the mother suffering in silence; pray for that person. Below I’ve written a few prayers you can pray for your friends. 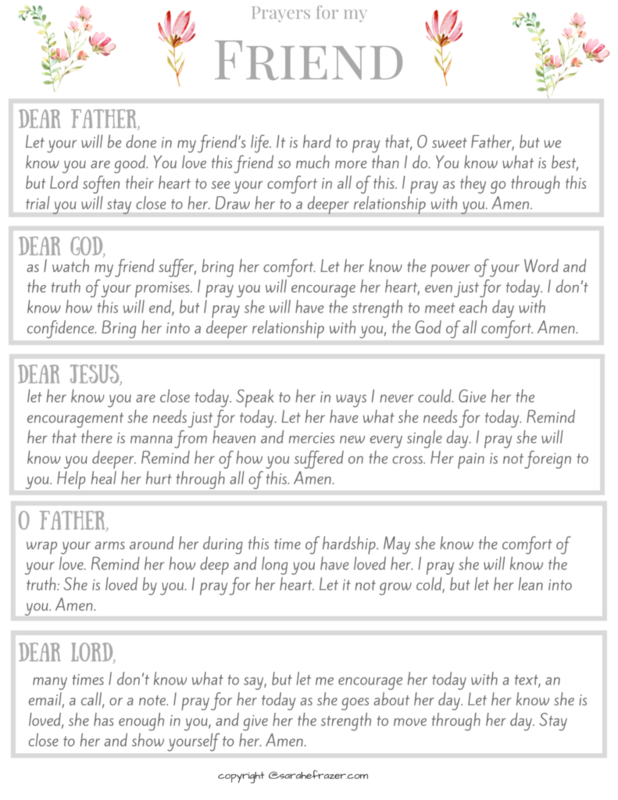 Print them off and keep them close when you just don’t know what to pray. Dear Father, Let your will be done in my friend’s life. It is hard to pray that, O sweet Father, but we know you are good. You love this friend so much more than I do. You know what is best, but Lord soften their heart to see your comfort in all of this. I pray as they go through this trial you will stay close to them. Draw them to a deeper relationship with you. Amen. O Lord, as I watch my friend suffer, bring her comfort. Let her know the power of your Word and the truth of your promises. I pray you will encourage her heart, even just for today. I don’t know how this will end, but I pray she will have the strength to meet each day with confidence. Bring her into a deep relationship with you, the God of all comfort. Amen. Dear Jesus, let her know you are close today. Speak to her in ways I never could. Give her the encouragement she needs just for today. Let her have what she needs for today. Remind her that there is manna from heaven and mercies new every single day. I pray she will know you deeper. Remind her of how you suffered on the cross. Her pain is not foreign to you. Help heal her hurt through all of this. Amen. O Father, wrap your arms around her during this time of hardship. May she know the comfort of your love. Remind her how deep and long you have loved her. I pray she will know the truth: She is loved by you. I pray for her heart. Let it not grow cold, but let her lean into you. Amen. Dear Lord, many times I don’t know what to say, but let me encourage her today with a text, an email, a call, or a note. I pray for her today as she goes about her day. Let her know she is loved, she has enough in you, and give her the strength to move through her day. Stay close to her and show yourself to her. Amen. « What Does It Mean to Dwell In God?